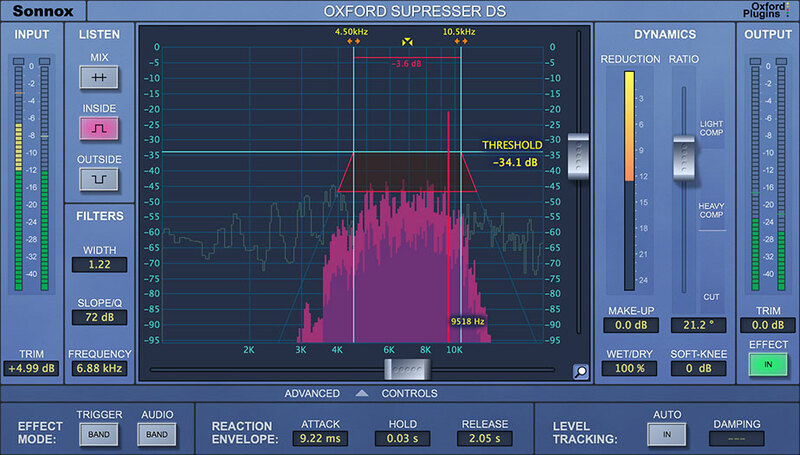 The Oxford SuprEsser DS is an optimized AAX DSP version of our award-winning De-Esser/Dynamic EQ Plug-In and is designed for use with Avid’s S3L and S6L live consoles and Pro Tools HDX. With a latency of sub 2ms, it’s perfect for live applications or tracking. It offers simple and precise control of aggressive frequencies between 1kHz & 20kHz – using the combination of 3 listen modes and a clear FFT display. Hear and see where to focus the Plug-In’s filters before dialling out a problem tone with a single control. There’s a simple mode for quick fixes with an advanced mode to hand for increased functionality and fine-tuning. The Oxford SuprEsser DS is also available in the following money-saving bundles. "...highly effective de-essing with less than 2ms of latency..."